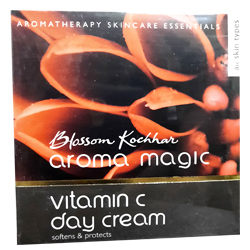 Buy Aroma Magic Vitamin C Day Cream Replenish Moisture, Lighten & Hydrate Skin, Strengthens Skin's Upper Layer, Optimum Sun Protection. A light non greasy day cream enriched with SPF 15. 100% free of petrochemicals, phthalates, toxic ingredients, artificial fragrance and colour. A light non greasy day cream enriched with SPF 15. Preparation, packed with natural source of Vitamin C, protects while the pomegranate juice strengthens the skin's upper layer. Shea butter and aloe vera gel balances the skin's pH level while deeply moisturising it to replenish the moisture lost during the day; extracts of orang, apple and algae rich in minerals and natural enzymes helps to lighten and hydrate the skin. The powerful blend of chamomile, lavender and helichrysum essential oils, together with avocado oil, offer optimum sun protection. Leave your skin soft, supple and exquisite every single day. It is best to use me on clean skin after using a toner. Apply me on your face and neck in gentle circular motions. Use me before applying make up. Aqua, Aloe Barbadensis Gel, Cucumis Sativus Seed Oil, Organic Butyrospermuim Parkii, Persea Gratissima Oil, Apple Fruit Extract, Luminess Extract, Pomegranate Juice, Citrus Aurantium Dulcis Fruit Extract, Chamaemelum Nobile Essential Oil, Lavandula Angustifolia Essential Oil, Helichrysum Italicum Essential Oil, Panthenol (Vitamin B5), Vitamin C (Ascorbic Acid).